On folio 93r of Manuscript B Leonardo proposed an entire fleet of attack galleys. 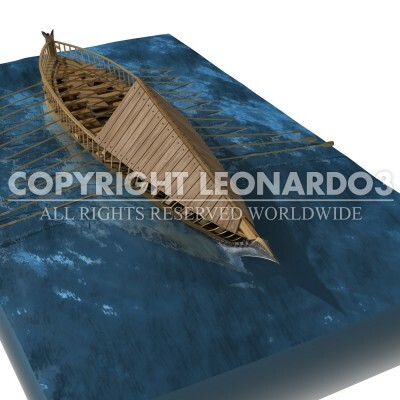 He added some innovative ideas to this design, which derives from galleys with naval rams. The boat has thirteen rows of oars on each side, a front shield, a submerged metallic ram and a reinforced internal frame. This way, because it so agile and powerful, the ship can ram the enemy and use the force of 26 rowers to go back and hit the enemy ship again until it sinks. The ship must be about 30 meters (98 feet) long and 2.5 meters (8 feet) wide. 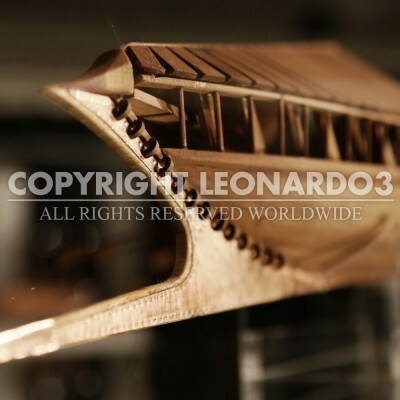 Leonardo also drew the section with the intersecting arrangement of the oars. In fact, the rowers on the right activate the oars on the left and vice versa.